Quite a while ago, Tom Reynolds, a reader in Atlanta, asked me to suggest a packing list for a golf trip to Ireland. I said I would, then forgot all about it, and recently he asked again. So here it is. This packing list is the result of two and a half decades of thoughtful experimentation. In making it, I’ve assumed that no spouse or health-department official will be in your group, and that you will buy at least one souvenir golf shirt, one souvenir golf sweater, and one souvenir golf hat while you’re abroad. I’ve also assumed that you are not planning to do anything rash, like meeting a client or going to a play. My strong preference with rain pants (which are also useful as wind pants) is to wear them as pants, if possible, rather than over pants. If the weather is nippy, I wear them over long johns. The reason for minimalist packing is not to avoid airline luggage charges; the reason is to reduce the tonnage of the gear you have to lug from place to place, and to make the most efficient use of the storage space in whatever vehicle you’re traveling in. Packing light also leaves space for all the overpriced golf stuff that you are almost certainly going to buy and lug home. Because linksland weather is highly unpredictable but within a relatively narrow range—I’ve played in shirtsleeves in Northern Ireland in November and been hailed on in Scotland in June—my list doesn’t change a whole lot from month to month. Think in terms of layers, and be prepared to allow time for wet items to dry out—especially shoes. Mike B. took his plug-in ski-boot driers on our most recent trip to Ireland. He never needed them, because our shoes never really got wet, but taking them wasn’t a terrible idea. On a golf trip to eastern Ireland twenty years ago, I took two rainsuits and needed them both. It’s possible to pack more than this, of course. It’s also possible to pack less. My friend Tony gets by with just his rain pants and one pair of chef pants, and some people believe that he never changes his shirt. 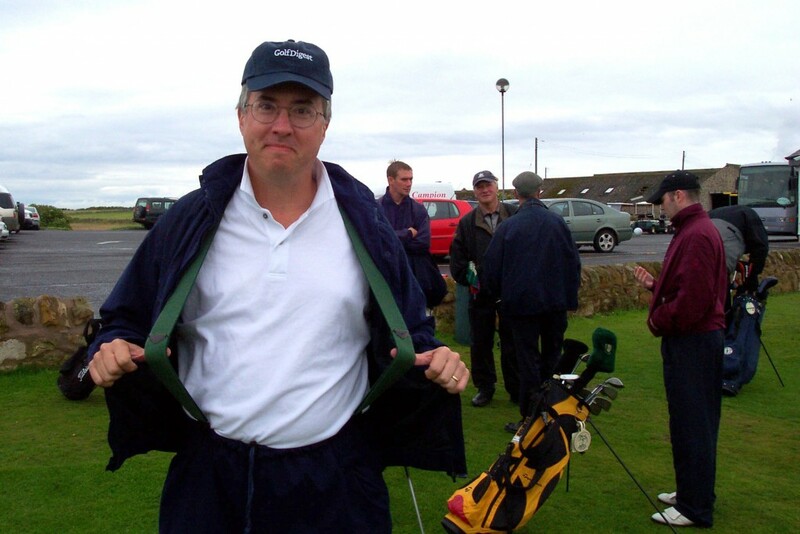 A few years ago, Golf Digest sent me to play all fourteen courses where the British Open has ever been held, and I realized toward the end of the trip, which lasted two weeks, that although I’d brought two pairs of pants I could have gotten by with one. The great thing about microfiber is that you can launder it with a hotel wash cloth, even if you’ve gotten chocolate on it. I recommend black. 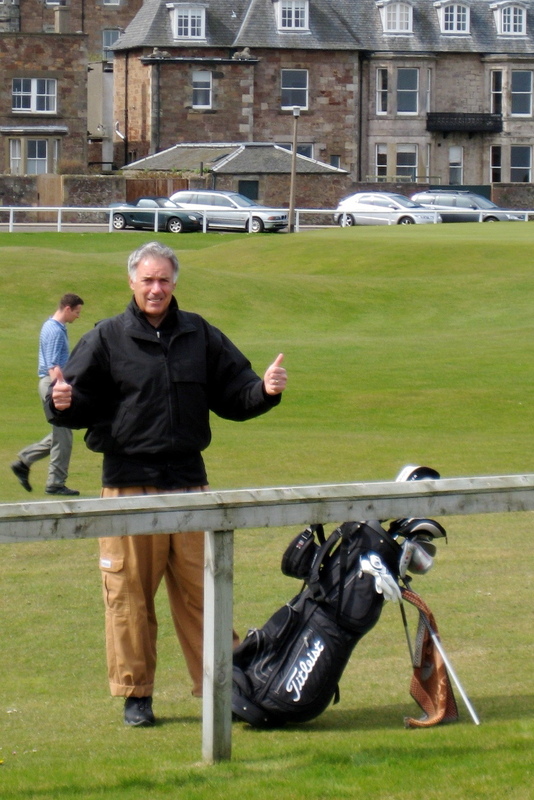 Tony in chef pants, North Berwick, Scotland, May, 2008. On my first golf trip to the British Isles, twenty years ago, I took a full-size suitcase. 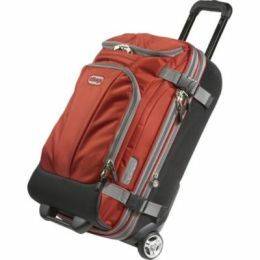 Now I take just a carry-on bag: a Mother Lode TLS Mini 21-inch rolling duffel, by eBags, which is currently selling for $190, shipping included (see photo at the top of this post). This is my favorite suitcase ever, even for non-golf trips. No matter what kind of suitcase you use, I recommend buying a selection of eBags Packing Cubes, which are soft, box-shaped modules that simplify intra-suitcase organization and make it easy to use your golf bag’s travel case for overflow packing. If you are going straight from the plane to a golf course—and that’s what you should be planning to do, in my opinion—you should wear golf clothes on the plane. For the trip home, it’s nice to have clean stuff. In my case, I flew home in a bought shirt, a bought sweater, and a pair of lightweight nylon pants that I hadn’t worn during golf. For many years, I’ve accessorized my rain paints with farmer-type suspenders, my first pair of which I ordered from the Vermont Country Store. (I now use a different kind, which you can order here.) Suspenders eliminate the main problem of rain paints, which is that they creep down every time you put wet hands into the pockets. I also own, and sometimes use, a pair of Velcro bicycle clips, which are handy if the legs of your rain pants are so long they drag on the ground, as many are. Vermont Country Store suspenders with rain pants, Scotland, 2004. On a golf trip to England in 2010, my friends and I had to take sports coats so that we could eat dinner in the clubhouse at Royal Lytham & St. Annes. Hacker (real name) took a crummy old one, intending to abandon it there—a plan I foiled by spotting it in a closet on the day we left and returning it to him at the airport. But the concept is brilliant: clothes you can wear to extinction, then leave behind. 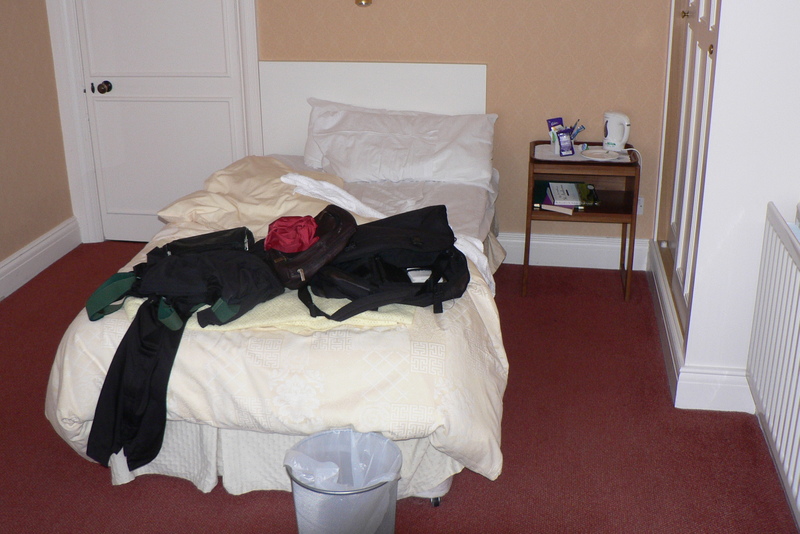 My bedroom in the Dormy House at Royal Lytham & St. Annes, May, 2010. My sports coat is in that pile somewhere. On our trip to Scotland and Ireland in 2014, Peter A. brought many pairs of super-cheap socks, and threw away each pair after a single use. This seemed smart in the abstract, but he ended up being the only person on the trip who got blisters. For this most recent trip, he brought more expensive throwaway socks (roughly a dollar a pair versus roughly fifteen cents) and didn’t have a problem. My personal preference is to pack the best wool socks I feel I can afford, and lots of them. This entry was posted in Accessories, England, Hacker (real name), Ireland, Scotland, Weather and tagged North Berwick, Royal Lytham & St. Annes, Seattle Sombrero, True Linkswear, Under Armour by David Owen. Bookmark the permalink. Great post. I’m curious why handkerchiefs are you new favorite accessory? I mean “your” not you, of course. In cool or windy weather, and also during allergy season, I end up wiping or blowing my nose on any semi-clean surface I can find, including the least disgusting parts of my golf towel. Kleenex blows away, but a single handkerchief will last an entire round. If it’s raining, I can also use a clean one to dry my glasses–although rain gloves work even better for that. You squeegee the lenses with your fingers, which act like a chamois. That’s an excellent underwear workaround. I myself don’t like non-cotton “sports” underpants–I bought a bunch once and found them unpleasant, especially in hot weather–but the efficiency principle is a good one. One good packing tip I learned from the woman who took care of two of my nieces when they were little: roll up clothes, rather than folding them. She did it with their little pajamas, but now I do it with almost everything. Thanks, David. Much appreciated and helpful. Another use for a handkerchief is wrapping one around a golf grip while playing in heavy rain. Surprisingly useful, and I usually don’t wear a glove. Got that one from Peter McEvoy. Take care. Great advice, although I disagree with leaving the UnderArmour shirt at home for the July/August trips. I always take at least one as I have found you are never more than 15 minutes away from 50 degree weather in Scotland at any time! Hi David. Good idea, I guess one other perk with putting all you clothes in a carry-on bag makes your travel cover your only checked bag, making you save on potential extra fees for a second checked bag ? Absolutely. And most airlines don’t charge more for a golf bag than they do for a regular suitcase, unless you go crazy. What golf bag do you recommend? I am probably the wrong person to ask, since I now push my bag on a cart. I like almost everything about my bag, which is a Sun Mountain, except the plastic joint that connects the legs. When I but a new bag I will probably be torn between Sun Mountain and Ping. If I were still carrying, the part I would study the most closely would be the shoulder straps. Ultra lightweight bags sometimes have lethally thin shoulder straps. Sorry, I meant, which travel bag to bring your clubs? I have a Sun Mountain Atlas travel bag, which I love but which isn’t sold anymore. If I were buying one today I’d get a Club Glove roller bag, with a Stiff Arm–the key accessory. A Stiff Arm keeps the bag from being crushed vertically by baggage handlers. I wouldn’t buy a hard case, because they’re a nuisance and some rental cars, especially in Europe, are too small to accommodate them. Are push carts available at most British Isle courses? How often are caddies available and their cost? I enjoy your site, thanks. Push carts–called trolleys–are available everywhere, and are widely used. Pack a short bungee cord to keep your golf bag from falling off. Check ahead about caddies. If you’re playing famous courses, they’ll probably be available, or obtainable, although they aren’t cheap. Quality varies. Mr. Owen, Thank you for this insight. I’m making my first trip to Scotland this June. What recommendation do you have for technology chargers? Also, my smartphone is not global – any suggestions? Thank you for your consideration. I’m not sure what you mean by technology chargers. In the UK, all you will need to plug in your laptop/iPad/phone/camera/whatever is a UK plug adapter. Scottish household current is 240 volts, and all your electronics will run on it, without any sort of transformer. It looks like this: http://amzn.to/12pA8Si. As for a phone–last year in Scotland, Ireland, and Norway I carried a spending a tiny, no-frills dual-band phone called a Telestial ekit V520 (telestial.com; recently on sale for $19). It doesn’t work in the North America, Japan, South Korea, or Yemen, among other places, but it will work in Scotland and most other places. It came with clear instructions, a SIM card, a UK phone number, a US phone number, a voice-mail box, and five minutes of prepaid talk time, which I topped off, on the Telestial website, for a buck a minute. It’s barely larger than a cigarette lighter, but it holds a charge forever, and it worked great. I am amazed you get back through US customs on your return – the smell of the clothes you have worn 12 times would probably kill the poor Customs agent that has to inspect it. David. Thanks for all the helpful information. I have a question about short pants (we’re going to Ireland first week of June)–should we bother, or just assume we’ll need long pants all the time? Also, if we wear short pants, what’s the deal with socks? We’ve heard knee socks are required, that white socks only (no dark or colored allowed), and, alternatively, that ankle length socks are ok, but the shorter ones that barely get above the shoe line are not. Thanks. i like Tony’s Golf pants a lot! does he still have those? Tony, former friend of David’s! Seriously, packing now for our trip to Ireland later today and this post is so helpful! less is more better! David, do you have a recommendation a particular brand of microfiber, polyester golf pants? The ones I’ve got now are by Nike and Under Armour, and I like them both, but you could do just as well for way less in the men’s department at Kohl’s. And black is definitely best for travel. Have a great time. Where are you playing? It will be a busy trip! Kingsbarns, St. Andrews – Old and New, Muirfield, North Berwick, Carnoustie, Turnberry, Prestwick, and Troon! My fifth trip to Scotland, but will be a first for my son, my son-in-law, and my son-in-law’s dad. Your packing tips will be a great help. I have always taken too much “stuff” before!